14:00 Tue 08/05/18. BSAR search call-out in progress for missing person near Mansfield. 04:00 Wed 08/05/18. 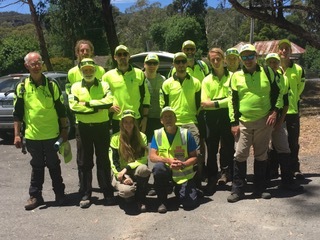 BSAR team of 12 departed Melbourne to join the search at Howqua. Saturday 29/04/18. 07:00. BSAR team of 9 departed to join search for missing person in the Werribee Gorge area. 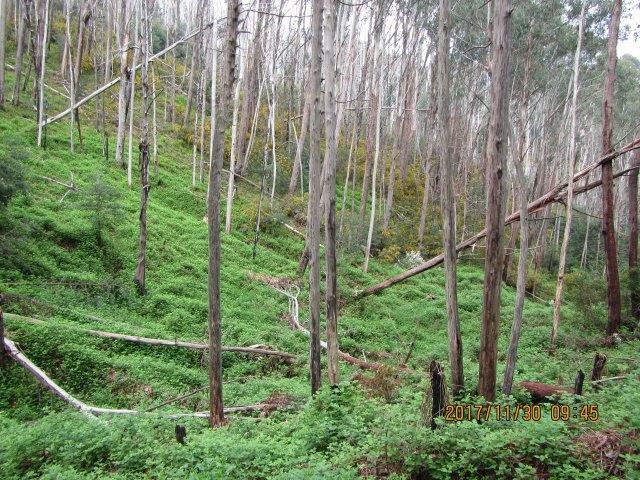 After searching during the day, the BSAR team returned to Melbourne late in the afternoon. The missing person was not found during the search. They were later found deceased on 5 May 2018. 28 April 2018 16:00. BSAR team departed to join search at Wonyip. 29 April 2018. BSAR team participated with search. 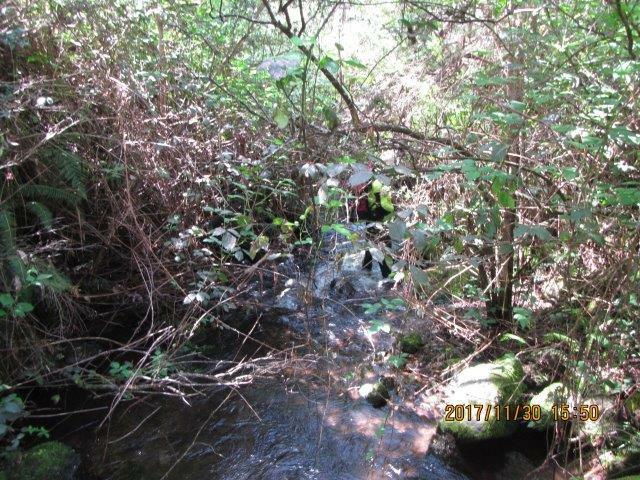 Missing person was located when they walked out to a farm house. 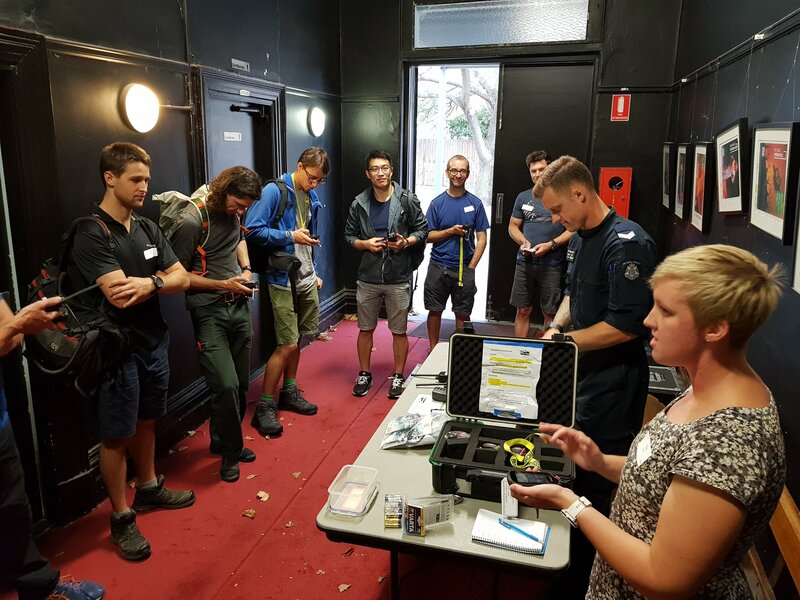 43 BSAR members attended; 10 on their first BSAR event and 8 members travelling from regional Victoria. 4 members of the Search and Rescue Squad participated. The Williamstown waterfront provided a good venue for a GPS and Police radio skills field exercise. The radio element was structured around search groups reporting specific information to the command post at each control. Search group leader workshops, built around group discussions of scenarios based on actual BSAR search events were very well received. Since BSAR’s inception in 1949 we have maintained a network of Club Contacts whose role is to participate in calling out club members active with BSAR to search for missing persons. Often working late at night, our Club Contact’s dedication and contribution to BSAR’s success as an emergency service cannot be overstated. Club Contacts were last used during the protracted search at Mt Dom Dom in 2009. However, over recent years technology has evolved to provide more efficient electronic methods to call out members, which means the role of Club Contact is now no longer required. I would like to extend our thanks and appreciation for your commitment and service to BSAR as a Club Contact. BSAR will continue to use our automated call-out system. If necessary, our Police Liaison Officers can also use a “fifty most active members” list to conduct a manual call-out. Many Club Contacts have ongoing roles within BSAR including Searchers, Delegates and Peer Supporters. We look forward to their continued contribution in those roles. For those who have only been operating as a Club Contact, we hope you will also remain connected with BSAR. Once again, I would like to thank all Club Contacts for their significant contribution to BSAR. 15:32 Tue 02/01/18. 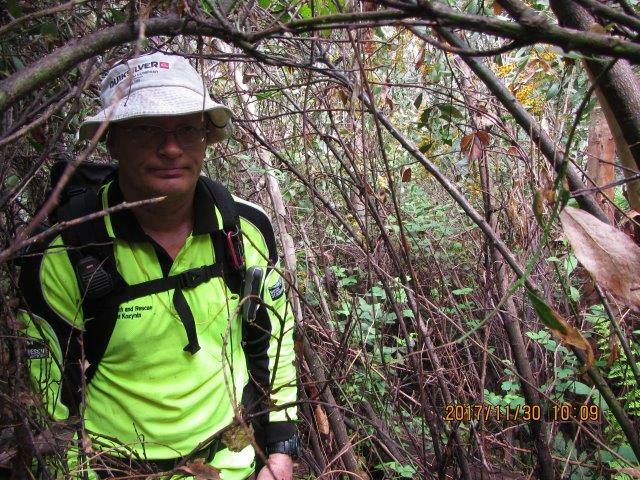 BSAR search call-out for missing person in the Grampians near Halls Gap. Wed 03/01/28. Fourteen BSAR searchers departed early in the morning to join the search. 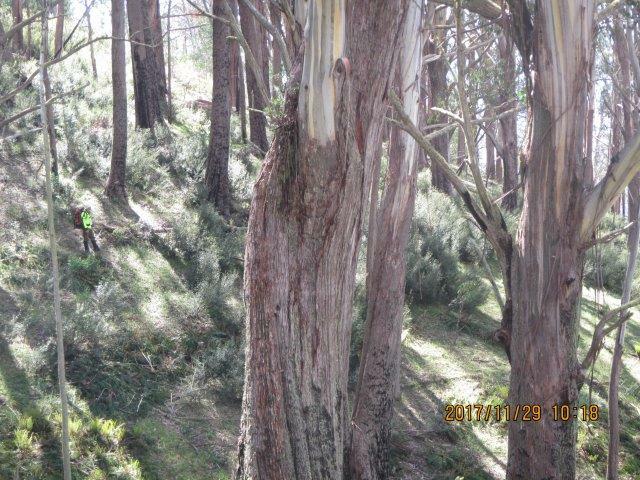 The missing person was located by Parks Victoria rangers on Wednesday morning. BSAR Field Organiser and Retired Rear Admiral Peter Briggs lead the Find AE1 team that found submarine HMAS AE1 103 years after it disappeared during World War 1. The fate of HMAS AE1 had been one of the navy’s most enduring puzzles, sparking 13 different retrieval attempts since 1914. 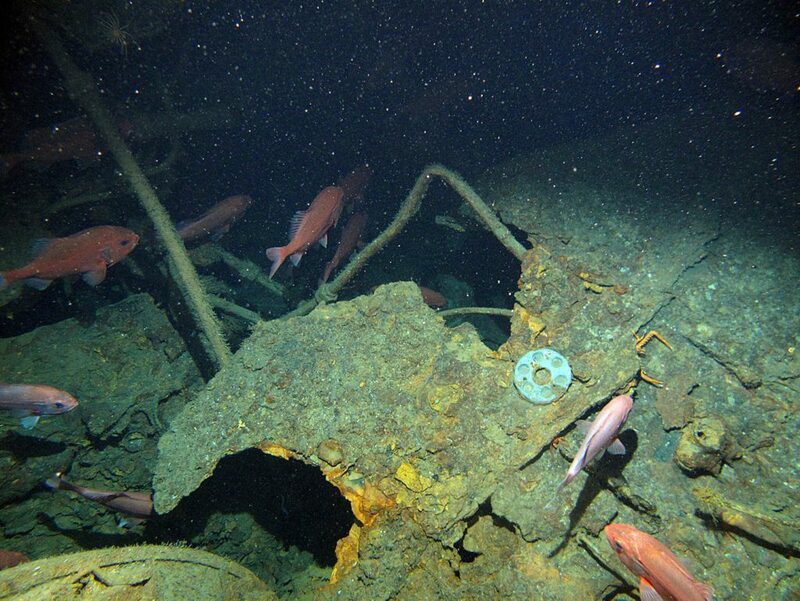 The 800-tonne vessel was discovered under 300 metres of water near Duke of York Island in Papua New Guinea. 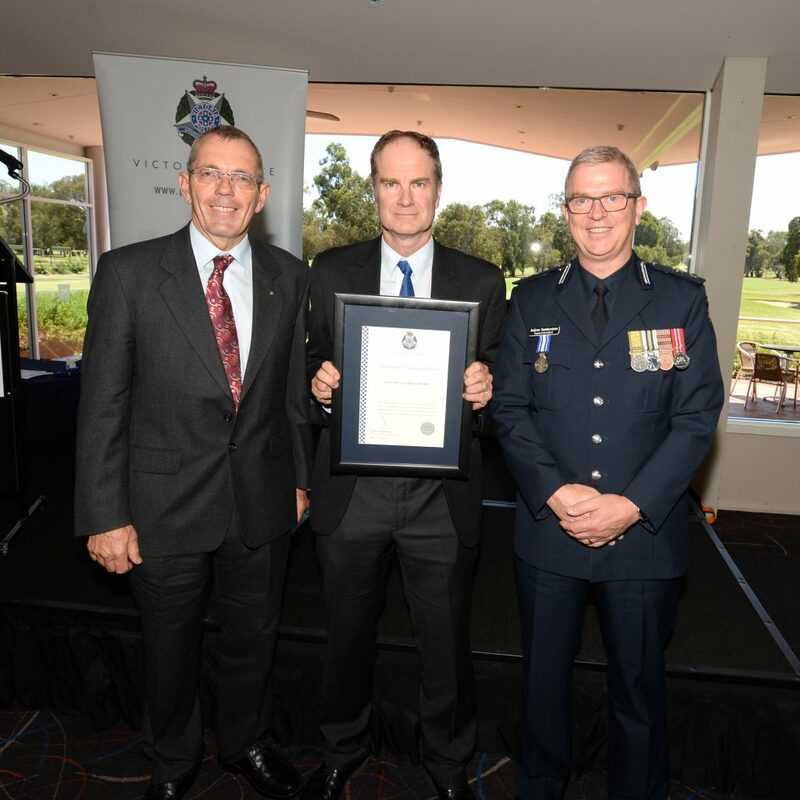 Peter Campbell and Duncan Brookes accepted a Divisional Commendation for BSAR from Victoria Police Eastern Region on 29 November 2017. The commendation was presented by Divisional Commander Paul Hargreaves. 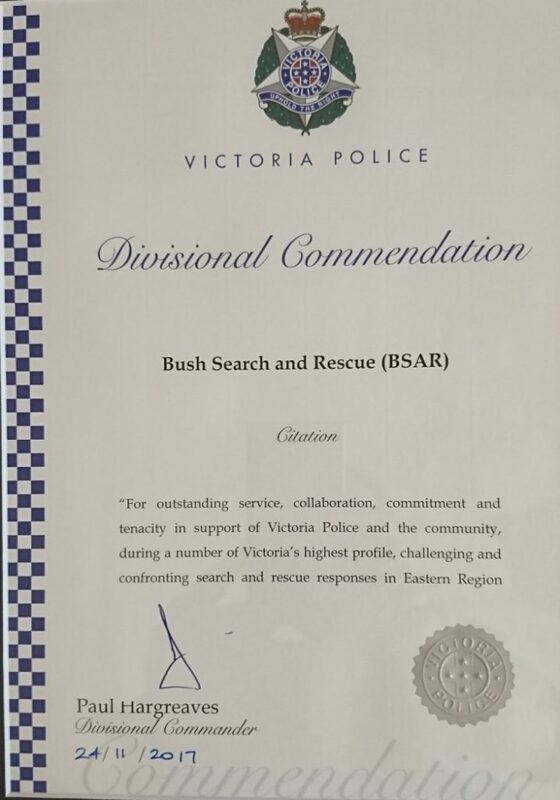 For outstanding service, collaboration, commitment and tenacity in support of Victoria Police and the community, during a number of Victoria’s highest profile, challenging and confronting search and rescue response in Eastern Region. Mon 11 Dec 2017. Search call-out for missing person at Werribee gorge. 12 BSAR members attended. Missing person was found deceased at 7 p.m.